TÃ©ann stair an Chumainn LÃºthchleas Gael i Maigh Cuilinn siar go dtÃ­ tÃºs an chÃ©id seo caite. BhÃ­ sÃ© eagraithe go maith faoin bhliain 1914. TÃ¡ taifead scrÃ­ofa ar fÃ¡il faoi thoscaireacht de chÃºigear Ã³n Chumann Peile ag freastal ar chruinniÃº den Chumann IomÃ¡naÃ­ochta 12 AibreÃ¡n 1914 ar mhaithe leis an dÃ¡ Chlub a chomhnascadh. D'ainmnigh na Clubanna comhaontaithe na hoifigigh seo leanas. ThÃ¡inig an chÃ©ad fhoireann geansaithe agus brÃ­stÃ­nÃ­ Ã³ Elvery's i mBaile Ãtha Cliath ar 31 Bealtaine 1914 ar chostas iomlÃ¡n de 1 - 17s - 6d(â¬2.38 i luach airgid an lae inniu). CeannaÃ­odh liathrÃ³id pheile amhÃ¡in agus ceithre sliotar Ã³ Murphy's, Port LÃ¡irge ar chostas 1-3s-0d(â¬1.40). SocraÃ­odh ballraÃ­ocht an Chlub ag 3d. The first set of emerald green jerseys and togs arrived from Elvery's of Dublin on 31st May 1914 at a total cost of Â£1-17s-6d (â¬2.38 in today's money). One football and four hurling balls were purchased from Murphy's of Waterford at a cost of Â£1-3s-0d (â¬1.40). The membership fee to join the club was 3d. Ba iad Uachtar Ard a bhÃ­ mar phrÃ­omhchÃ©ile comhraic sna blianta tosaigh. ImrÃ­odh comÃ³rtas laistigh den pharÃ³iste sa bhliain 1914 idir foirne Ã³ ChÃºlachaÃ­, Poll na gCloch agus Tulach UÃ­ Chadhain. BhÃ­ an bua ag foireann CÃºlachaÃ­. TÃ¡imid faoi chomaoin ag TomÃ¡s BairÃ©ad as an eolas seo, atÃ¡ bunaithe ar na miontuairiscÃ­ Ã³na chÃ©ad chruinnithe. ThÃ¡inig cÃºrsaÃ­ polaitÃ­ochta chun cinn sa bhliain 1914 nuair a ritheadh rÃºn ag iarraidh tacaÃ­ochta i ngach bealach arbh fhÃ©idir do Ghluaiseacht NÃ¡isiÃºnta na nÃglach Ã³na mbaill ar fad sa pharÃ³iste. Go deimhin dhÃºnmharaigh na DÃºchrÃ³naigh SeÃ¡n Mac EoghagÃ¡in ball sinsearach den chlub. Oughterard provided the main opposition in those early days. 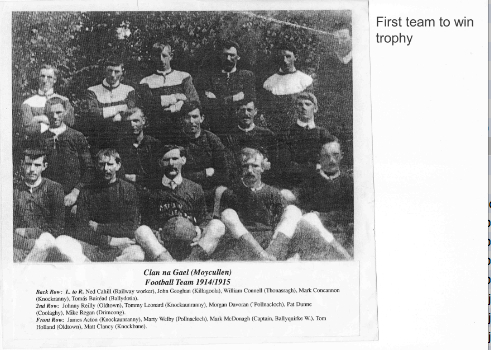 A parish competition comprising of teams from Coolaghy, Moycullen village, Poulnaclough and Tullykyne was played in 1914. Coolaghy won it. We are indebted to the late TomÃ¡s BairÃ©ad, who preserved the minutes of those early meetings, for the above snippets. Politics entered the GAA scene in late 1914 when a resolution was passed calling on all members in the parish to support the Irish National Volunteer Movement in every way possible. Indeed, a prominent member of the Football Club - John Geoghegan (Ugoole) - was executed by the Tans. Blianta ar an nGannchuid/The Lean Years. Chuir an chÃ©ad chogadh domhanda, Cogadh na Saoirse agus an Cogadh Cathartha a lean Ã© isteach go mÃ³r ar an gClub agus bhÃ­ sÃ© i dtreo dheireadh na bhfichidÃ­ sular cuireadh eagar ar an gclub in athuair. Glactar leis go forleathan gur i 1928-29 a bunaÃ­odh an club reatha. 6d a bhÃ­ mar thÃ¡ille bhallraÃ­ochta sa bhliain 1928. Thosaigh an Club ag glacadh pÃ¡irte i gcraobh shÃ³isearach an chontae. NÃ­ raibh mÃ³rÃ¡n Ã¡idh leis sna fichidÃ­, na trÃ­ochaidÃ­, na ceathrachaidÃ­ nÃ³ luath sna caogaidÃ­ gur shroich sÃ© an pointe sa bhliain 1955 nach raibh foireann ar bith ag glacadh pÃ¡irte sna comÃ³rtais contae. NÃ­ amhlaidh an scÃ©al Ã¡fach le cÃºrsaÃ­ iomÃ¡naÃ­ochta agus bhain siad roinnt buanna cÃ¡iliÃºla, ina measc craobh chontae sÃ³isearach sa bhliain 1937 agus 1945 mar aon le craobh idirmheÃ¡nach agus craobh mhionÃºir sa bhliain 1945. The First World War, the War of Independence and the ensuing Civil War brought the usual problems to the GAA in the parish and it was not until the late 1920's that the clubs were re-organised again. It is widely accepted that the present club was formed in 1928-29. The membership fee in 1928 was 6d. 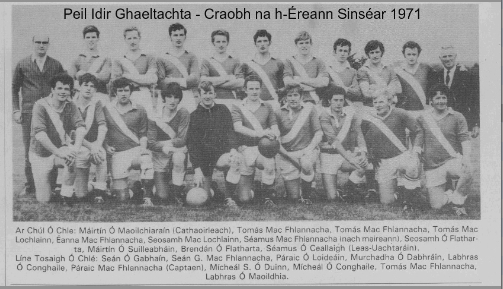 The club began to take part in the County GAA at junior level. It did not have any great luck in the 20's, 30's, 40's or early 50's in football so much so that in 1955 there were no football teams entered in the county competitions. However the hurlers recorded some famous victories in these years including county titles in 1937, 1944 (junior) & 1945 (intermediate & minor). Sa bhliain 1956 socraÃ­odh foireann shÃ³isir agus foireann mionÃºir a chur chun pÃ¡irce in athuair. BhÃ­ rath orthu ar an tort agus bhain siad Craobh Iarthair an Chontae sa bhliain chÃ©anna. Chuir an bua sin tÃºs le RÃ© Ãrga (1956 - 1973) Chumann Peile Mhaigh Cuilinn agus Ã³ shin tÃ¡ an Club imithe Ã³ neart go neart agus go leor comÃ³rtais rÃ©igiÃºnda agus contae buaite aige ( fÃ©ach liosta Ã©achtaÃ­). Sa bhliain 1961 rinneadh dhÃ¡ chlub faoi leith in athuair den Chumann Peile agus IomÃ¡naÃ­ochta i ndiaidh dÃ³ibh a bheith comhnascatha le 47 bliana. In 1956 it was decided to enter Junior and Minor football teams again. The club met with instant success and won the West Board Championship Cup the same year. This victory was the beginning of the "Golden Age" (1956-73) of Moycullen football, as from then on the club has gone from strength to strength and has won several divisional and county competitions (see list of achievements). In 1961, the Hurling and Football clubs became separate independent clubs once again, having been amalgamated for 47 years. Bhain an Club stÃ¡das mar Chumann Sinsir sa bhliain 1964 trÃ­ Chraobh ShÃ³isir an Chontae a bhuachaint agus seachas seal gairid mar chumann idirmheÃ¡nach, bhÃ­ Maigh Cuilinn ina chlub sinsir go dtÃ­ gur chaill siad an stÃ¡das sin sa bhliain 2006. Sa trÃ©imhse sin Ã¡fach tÃ¡ teipthe ar Mhaigh Cuilinn craobh shraithe nÃ³ craobh an chontae a thabhairt leo in ainneoin gur shroich siad trÃ­ chraobh chontae. Faoi lÃ¡thair glacann an Club pÃ¡irt i ngach comÃ³rtas faoi aois, sÃ³isear agus idirmheÃ¡nach sa chontae. In imeacht na mblianta is iomaÃ­ imreoir i ngach grÃ¡d ar tugadh aitheantas dÃ³ trÃ­ Ã© a roghnÃº ar fhoirne an chontae. The Football club achieved Senior status in 1964 by winning the County Junior Championship and, except for a short stay at intermediate level, Moycullen has been senior ever since until 2006. However, Moycullen has yet to win a County Senior League or Championship, despite reaching 3 County Finals. Presently, the club takes part in all under-age, junior and senior competitions in the county. Over the years, many of our players have been honoured in all grades by the county.